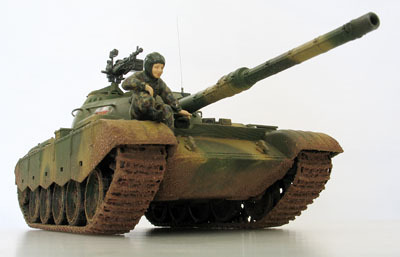 Most of people who took photograph of their miniature-models will just snap from the position where their eyes saw. They do not think much about the composition. It seems as okey, but actually, our eyes see differently than the camera. Remember that our eyes use single lens with single focal length. It can't zoom, it can not vary the focal length, and our two eyes see in three dimensional, while the camera can zoom closer (unless if you're using a pocket camera with single focal length) and see in two dimensional. So the perceivable result of the image will be different between a camera and our eyes. Now let's try to explore what differences a viewing angle may create. The above photographs were taken using the same camera, but with two different focal length. The picture on the left was taken using wide angle lens, and the camera was close to the subject. While the picture on the right was taken using a mid-tele lens, the camera was positioned farther away from the subject to maintain the same subject's size registered on the image. The viewing angle of a wide angle lens (focal length of 35 mm or less, in 135 format) is wide enough, and it will create a perspective distortion; look at the different size of the plane's left and right wing on the first photograph, its right wing seems as much larger than the left one, unproportional. And also note the slanting of the main wing and horizontal stabiliser, which angled outward. The viewing angle of a long focal lens or tele (focal length of 80 mm or more, in 135 format) is narrower, as demonstrated on the photograph (above right). On the image created with this long focal length, everything looks proportional. The left and right wing looks almost at the same size, and the stabiliser does not angled outward. So the long focal length will give a proportional look. But in reality, the perspective of a wide angle lens may give an impressive image, a punching look which will make people stare. You can use this impression to your advantage. Now we will see where to position the camera. 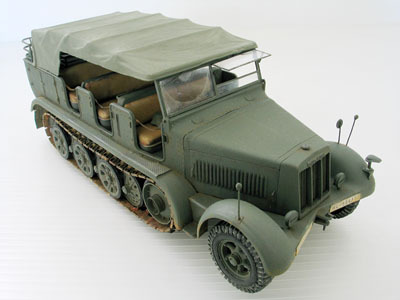 Generally, there are several popular positions which will generate certain impression out of the miniature-models. 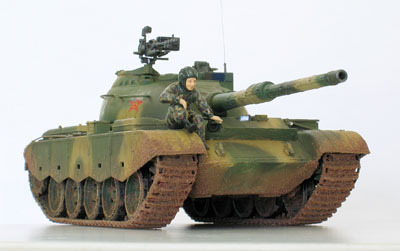 "Ground position" is when the camera sit at the same level as the model's "ground". This kind of position is useful in creating a side-view or front/rear view. The focal length is usually long. Try to avoid using a wide angle lens for a ground position, except in the corner, such as shown on the photo below. A ground level view on the corner combined with a wide-angle lens will emphasize perspective angle, creating an impressive view. While the same ground-corner view created using a lens with long focal length, will give a "flat" view (see the lower photograph). Of course there is nothing wrong with both pictures, it is just a matter of preference: what kind of "look" you want to achieve. But again, take note, that the utilization of wide-angle at ground position most likely will be nice only for a corner view. In the elevated position, the camera is positioned higher than the subject. This method is mostly useful for corner view. And sometimes is taken using wide-angle lens to emphasise the perspective. See photograph on the left. With the elevated position, you may use any focal length, whether a wide angle or tele. But if you are using a wide angle lens, pay attention to the distortion. Using a wide angle lens at the elevated position for side-view, will create undesirable distortion. 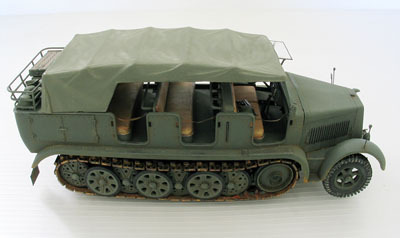 Look at the picture on the left: this side view of a 1/35 scale Sd.Kfz.7 was shot using a wide angle lens at elevated position. 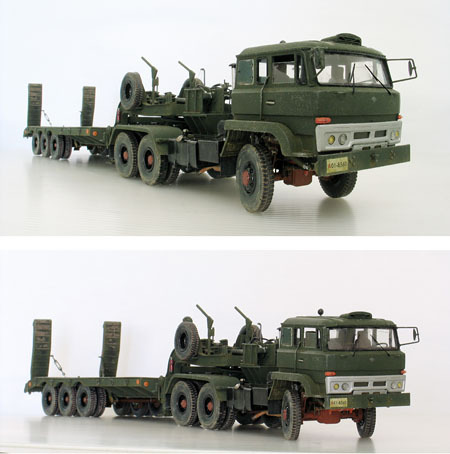 The truck became bulbous, creating a distorted view, an effect which is usually associated with curved mirror. So avoid this from happening, unless you really want such kind of effect. Photographing a long miniature-model can be tricky. It pose no problem with side-view, but may need some caution when taking picture from the corner. But there is a catch: the longer the focal length of the lens, will create a flatter look. Thus the vehicle may look shorter than it supposed to be if the lens' focal length is too long. Therefore if you want to portray a "correct" impression, then you have to adjust the focal length so that the image is satisfactorily proportional. There is no guideline about which focal length is suitable, since it depends on the camera position and angle. So start with a mid-tele, then adjust forward. The picture below is another example of a long miniature-model, in this case: a set of train, locomotive and its carriages, the Bavarian S3/6 in HO (1/87) scale. This photo was shot using a medium-tele lens, creating a flatter image. The camera was ground-positioned, with corner viewing angle. Long-object will also cause another problem; the depth of field may not sufficient to cover the whole length of the object, thus resulting in out-of-focus (blurry) on some section of the object. This issue will be covered on Chapter 11.